Summer Wind se trouve directement face à la plage avec des vues imprenables et un accès direct à la plage. Vous pourrez profiter de la grande terrasse face à la plage partiellement couverte parfait pour prendre le soleil ou se détendre à l'ombre. Les points de vue du front de mer continuent à l'intérieur avec la cuisine, salle à manger et salon donnant toutes sur la magnifique côte du golfe. Le salon est un espace ouvert avec un plafond voûté expansive. Le salon dispose d'une grande télévision à écran LCD. Il y a deux suites de maître à l'étage deux offrant une vue sur le golfe limitées et lits queen. Les deux autres chambres d'hôtes sont en bas des escaliers et sont également reines. Sommeil plus 2, les enfants, dans la chambre avec lits superposés en bas des escaliers. Il y a trois salles de bain complètes Total 2 dans les suites de maître à l'étage et une salle de bains commune en bas. La maison a accès à la piscine communautaire en front de mer qui dessert les quatre maisons que nous avons à cet endroit: Wall Street, Wings of Eagles, Summer Wind et Summer of '42. Nous aimons les gens de tous les âges et nous voulons que tout le monde profite de notre maison. Cependant, nous ne demandons qu'un adulte de 25 ans ou plus pour réserver la maison et être présent à la maison pendant votre séjour. Nous ne louons pas à une personne de moins de 25 ans. Nous avons fait pas exception à cette politique. We had such a great time on our trip and really enjoyed our stay in Summer Wind! This was our first time staying closer to Fort Morgan and we absolutely loved how quiet it was! There was plenty of room for football and wiffle ball on the beach, and the house was well stocked with what we needed! Hi Therese, thank you for the five star review! We are so glad you enjoyed the peace and calmness Fort Morgan provides, as it is more family oriented. 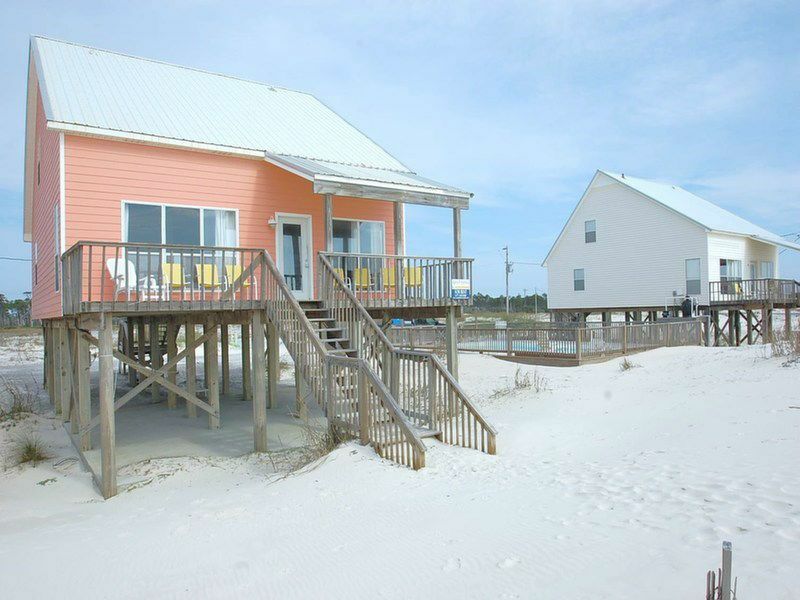 We are honored you chose Harris Properties to host you and we hope you found your perfect spot in the sand! Good place-especially if you have fur babies! The location is perfect if you want to avoid the typical Gulf Shores crowd. There is plenty of space with beds for 10! The home is very spacious, overlooks the beach, and was perfect for our visit. We had a few issues that we made the management company aware of (the carpets needed to be cleaned, there was a strong urine smell). But we would stay again due to location and convenience with the dogs. Hi Amy, thank you for the review as it helps us improve our properties and we love to hear guest feedback! Thank you for communicating this issue to us, we will forward this information to maintenance. We are happy you and your fur babies found Summer Wind to be an enjoyable experience. Until next time, thank you for letting Harris Properties find your perfect spot in the sand! We enjoyed our stay here! Plenty of room here. Had a small problem with the microwave over the stove but management responded quickly which we appreciated very much. Be prepared to drive a good way into town for restaurants etc. Hello Elizabeth! Thank you for the great review. We are so glad that you enjoyed your stay at Summer Wind! We do apologize that you had a problem with the microwave but we are happy that we were able to resolve the issue quickly for you. Thank you for letting Harris Properties help you find your perfect spot in the sand. We hope to host you again soon! The house needs some improvements. A lot of soft spots on the floors and the dryer doesn't work well. But with that being said, the house served its purpose for us. It gave us a place to sleep and eat. We spent the entire vacation at the beach, which was a short walk out the back door. We would definitely stay here again. We here at Harris Properties are happy to hear that you enjoyed the home Summer Wind during your stay with us. Thank you for the great feedback about the home and that you found this home to be spacious and accommodating. We will take steps to have the issues you outlined rectified. Thank you for the great feedback about the home and that you found this home to be overall a great place. I want to apologize that we were not able to make this a 5 star review for you. It is a really nice and quiet place for families to stay. We stayed the entire week that our youngest son got married. There were 9 of us total and we had out of town guest come to visit some during the day. There is plenty of room, plenty of bedding space and plenty of room to get away from the rest of the guest if you like. We are happy to hear that you enjoyed the property Summer Wind during your stay with us. Thank you for the great feedback about the property and that it met all your needs during your young son's wedding.